KRASNAYA POLYANA, Russia – Marielle Thompson and Kelsey Serwa have worked well together since first becoming skicross teammates a few years ago. Serwa helped the younger Thompson when she was first settling into the sport, gave her some advice and they quickly became good friends. That strong team dynamic was evident Friday at the Sochi Games and it paid off with a pair of Olympic medals. Thompson stormed out of the gate early and didn’t let up to win gold while Serwa followed right behind her to take silver. Occupying two of the four spots in the final gave the Canadians an edge and they used it to their advantage. Serwa and Thompson had barely crossed the finish line at Rosa Khutor Extreme Park when they gleefully leaped into each other’s arms. The few dozen Canadian fans in attendance starting jumping up and down too before belting out a version of O Canada. Sweden’s Anna Holmund took the bronze medal on a grey, rainy afternoon. Georgia Simmerling of West Vancouver, B.C., was eighth in the seeding run but crashed in the quarter-finals. An Alpine Canada spokesman said she was nursing a sore ankle. It was the second straight Olympic title for Canada in this event. Retired skier Ashleigh McIvor won four years ago at the Vancouver Games. Thompson and Serwa started off strong and communicated with each other once they set the early pace. Serwa called out to her teammate to let her know she was planning to go inside on the first turn and Thompson gave her a little space. They worked as a unit to help minimize the potential for a blockage or contact, a frequent occurrence in a sport that sees four racers furiously jockey for position as they navigate jumps, rollers and turns at high speed. A little communication can often go a long way. 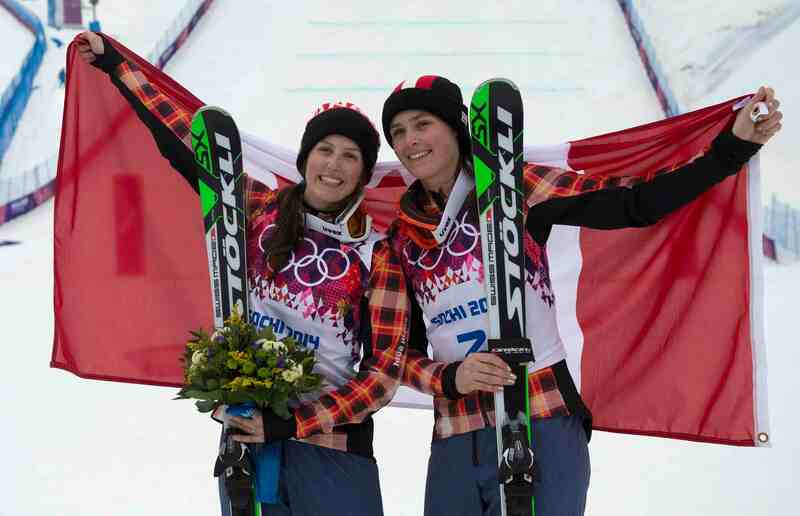 The Canadians were among the medal favourites entering the competition. Thompson has won two World Cup races this season and Serwa took the World Cup title on this course last year. Thompson, 21, was strong in her early heats and took control in the final. Serwa, 24, was nearly eliminated in the semifinal round. She needed a late surge at the finish to take second place by half a ski length. “I’ve never tucked so hard in my life,” she said. The Kelowna, B.C., skier also had a strong start in the final round and used that momentum to her advantage. It was an emotional afternoon for the Canadians. They dedicated their performance to Nik Zoricic, the skicross racer from Toronto who died in a race in Switzerland in 2012. They wore blue pants as a tribute to him. Zoricic wore blue jeans to training in the early days because he didn’t have the right kind of snowpants. Fog hovered in the area and a light rain fell throughout most of the competition. The seeding run was delayed for 15 minutes due to the weather and there was another brief interruption in the quarter-final heats before the fog started to clear. The results came a day after Canada just missed the podium in the men’s skicross. Calgary’s Brady Leman made it to the big final but settled for a fourth-place finish. Thompson, from Whistler, B.C., has emerged as an elite star on the World Cup circuit. Serwa has also posted strong results but has battled serious injuries in recent years. Serwa, 24, who was fifth in this event at the Vancouver Games, injured her back in 2011 and won a world title a week later. In 2012, she tore the anterior cruciate ligament in her left knee and won a World Cup in her fourth race back. Serwa tore the ACL again last year and considered stepping away from the sport. Both have come a long way in the last four years. They have worked hard on their own and relied on teammates to help them along the way. “Kelsey really helped me when I was younger, she really taught me a lot of things,” Thompson said.